The COP15 Climate Conference kicks off next week in Copenhagen, and Inhabitat will be on the scene to bring you all the latest news from this monumental event! In addition to the official U.N. proceedings, the entire city will experience an explosion of eco art, events, and expos all focused around climate change and sustainable design. There will be tons of things to see and do, so read on for the cultural showcases and exhibitions that we’re most looking forward to! This year Copenhagen is getting into the holiday spirit with the unveiling of a tremendous people-powered Christmas tree! 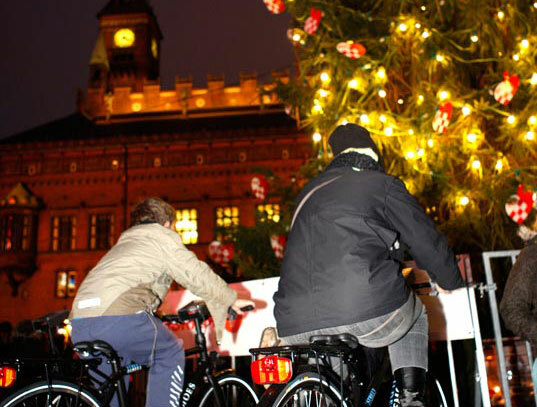 It’s easy to contribute to the holiday cheer – simply jump on a bike and start peddling; the kinetic energy you generate will be used to light up the tree. From November 13th – December 18th the city of Copenhagen will light up the night with glowing artworks focused around specific climate related topics. We can’t wait to see Green Architecture For the Future, a living exhibition of green architecture hosted by the Louisiana Museum of Modern Art. Running from now until the 18th of December, this exhibit will showcase new inventions, materials, and processes that are pushing architecture towards a more sustainable future. Running from December 1st – December 18th, the Green Tech for Buildings Expo will showcase eighteen leading companies that are creating environmentally friendly products, solutions and services for energy efficient buildings. The National Museum of Denmark is hosting a free exhibition through December that will explore the ways that Denmark’s climate has changed from the freezing Ice Age through warm forested eras until today. Danish artist Jens Galschiot will be installing a red pulsing line of light throughout the heart of Copenhagen that visualizes the consequences if all of the ice in Greenland melts. The International Union of Architects will be hosting a series of lectures that demonstrates a variety of solutions to climate change ranging from clever renovations to innovative new projects. 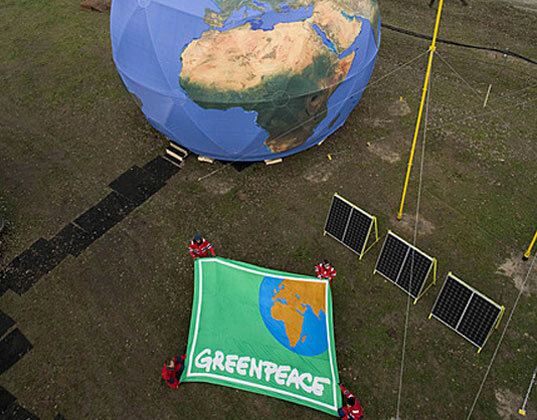 Greenpeace has erected a four-story tall Climate Rescue Station modeled upon the globe that will be used as a platform to warn the world against the global consequences of using coal and fossil fuels for energy. The COP15 Climate Conference kicks off next week in Copenhagen, and Inhabitat will be on the scene to bring you all the latest news from this monumental event! In addition to the official U.N. proceedings, the entire city will experience an explosion of eco art, events, and expos all focused around climate change and sustainable design. There will be tons of things to see and do, so read on for the cultural showcases and exhibitions that we're most looking forward to!